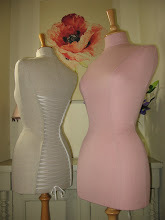 These wasp waist mannequins have been a long time coming! I have been wanting to reproduce antique French waspwaisted mannequins for some time now, but a combination of searching for just the right materials and completing orders (which have to take priority!) has meant that it has taken until now to launch them. They have been formed from an original antique wasp waist Stockman torso from c1900 and they have a tiny 18.5 inch waist! My aim in producing these vintage styled mannequins was to replicate as closely as possible the tailoring and wood work of the originals. Most importantly, the torso itself is made in the original way and is a thick papier mache construction - so no foam or polystyrene. Have a lovely week, Julie. 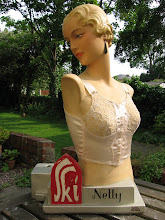 The fabric of this lovely French Stockman wasp waist mannequin was extensively water stained when she came to me. A customer asked me to recover her, restoring her to how she must have looked when she was new, all those years ago. I have used the Austen Natural fabric from the Natural Collection and tailored the fabric to replicate the original seam work exactly. The original fabric is still underneath, incase someone in the future wants to take her back to her original condition.